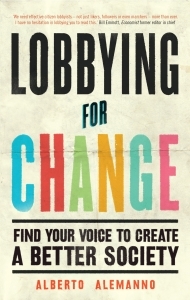 In Lobbying for Change: Find Your Voice to Create a Better Society, Alberto Alemanno seeks to demystify and democratise the practice of lobbying by inspiring readers to become ‘citizen lobbyists’. Serving as both a galvanising wake-up call and an accessible, positive and practical guide to those looking to influence public policy, this book will awaken your inner citizen lobbyist, help you identify the possibility for change and encourage you to make your voice heard, recommends Barbara Aubin. If you are interested in this book review, you may also like to read an interview with author Alberto Alemanno, ‘Lobbying for Change as a New Theory and Practice of Active Citizenship’. Lobbying for Change: Find Your Voice to Create a Better Society. Alberto Alemanno. Icon Books. 2017. Whether you feel unhappy with the way our societies are working, powerless to make a change or simply tired of being a spectator to a show that is driven by only a few economic actors, you should read Lobbying for Change, Finding your Voice to Create a Better Society. As Alberto Alemanno writes: ‘This is not an academic book. This is a volume that aspires to reach a broader audience, and to inspire you.’ Inspire you to get involved in the mystified world of lobbying and unfashionable machinery of government to become what Alemanno calls ‘a citizen lobbyist’. Lobbying means persuading people who hold power to care about an issue. Traditionally monopolised by ‘professional lobbyists’ who are remunerated by companies, citizen lobbying aims at democratising this activity. By giving you the same means as professional employs, citizen lobbying has the potential to act as a social equaliser, argues Alemanno. The reader will certainly feel inspired, empowered and ready for action by the end of this book. Divided into three parts, Lobbying for Change starts with the identification of ‘The Problem’ in modern societies, elaborating on the issues of ‘passive’ citizens, dominant actors and representative democracy. With this section making up slightly over ten per cent of the book, the rest is overwhelmingly positive and empowering. So, while the reader might feel initially discouraged, curiosity will naturally lead you to ‘The Solution’ section. The ‘Solution’ part draws on the concept of lobbying and the role that citizens can, and should, play in it. Chapter Three elaborates on the techniques, tips and tricks of effective lobbying to democratise the activity. Throughout the book, Alemanno uses quotes from inspiring characters, which orient the reader’s attention to the important points being made. From Albert Einstein and Abraham Lincoln to J.K Rowling and Winnie the Pooh, the selection makes for an inclusive and memorable book. The first part of Lobbying for Change is a wake-up call. You face the problem head on and, as a result, you might feel resentful. The question is whether you decide to focus on this unfair reality or break the silence and go on with Chapter Two. What are your options? Voting and running for office are two main ways of taking part in a democracy, but these face increasing limitations and are undergoing a profound crisis. Alemanno outlines the urgent need to reconnect elected representatives with the public. His book is both timely considering current social, economic and political volatility, and also offers a different perspective to bridge the gap. From his perspective, citizens have a central role to play. Let’s explore this further using the example of increased criticism of the European Union. While the EU is often depicted as being undemocratic, a closer look at its decision-making and participatory mechanisms reveals a different truth. In some instances, the EU is even more democratic than some member states. For example, its legislative process — whereby the Council (elected representatives from member states) and the European Parliament (directly elected by EU citizens) decide the law — is more democratic than the UK bicameral system. In the latter, an unelected upper chamber in which 92 peers have inherited their title hold the legislative power. The real issue, then, seems to have more to do with the lack of knowledge and participation in EU politics specifically as well as on a broader scale. This is where Lobbying for Change might provide a great opportunity by playing a missing pedagogical role. Indeed, the novelty of Alemanno’s argument is that instead of outsourcing problems to politicians and waiting for them to act, he proposes a bottom-up solution. By rethinking citizenship, this book encourages ordinary people like you and me to embrace the change we are asking for. As put by the author: ‘It’s time we turn the widespread criticisms of politics into an active democratic virtue’ (103). The good news is that while you might be thinking that it is not your job to do the job of politicians, you will reap significant benefits for it. Chapter Two demonstrates that citizen lobbying has the potential to harness your talent and maybe unveils a hidden one too. Lobbying for a cause you care about will increase your feeling of belonging to a community, and research referenced in the book also demonstrates its positive effect on health and wellbeing (4). In short, Alemanno presents a convincing argument for lobbying as a way to achieve your self-fulfilment needs and finally get to the top of your Maslow’s Pyramid. Chapter Three accounts for the majority of the book, providing a comprehensive ‘Toolbox’ for anyone looking to influence public policy. Alemanno’s ‘10-Step Citizen Lobbying Guide’ is well-explained and detailed enough to lead you in the right direction, provided that the necessary effort and commitment are put in place. It is filled with practical examples and stories that help the reader navigate the guide. There is also an essential introduction to the legislative process, stakeholders mapping, evidence-gathering and other knowledge and techniques essential for maximising one’s lobbying chances. Although this guide is helpful and very pedagogical, there are some drawbacks. While the first part of the book insinuates that citizen lobbying is accessible to anyone and fairly easy to implement, I have some doubts. Indeed, the usual disenfranchised suspects and the ones who need the most change might find it difficult to apply some parts of the guide, such as the research work and evidence-gathering that are essential to starting any lobbying campaign. Although the author argues that lobbying, unlike activism, has the potential to induce systemic change by targeting policymakers, the latter seems actually more accessible. It also depends on preferences, but for interested readers I would recommend Blueprint for Revolution written by Srdja Popovic. With similar goals but a different methodology, the author, leader of the student movement Otpor! that overthrew dictator Slobodan Milošević and established democracy in Serbia, also presents anecdotes and techniques for making a change through activism. To balance this criticism, I would argue that part of Alemanno’s message is the importance of solidarity. He writes: ‘We have talents, expertise […] yet we mobilise them not to improve the lives of the less privileged, but to make our own lives marginally more comfortable.’ To my understanding, this would mean that it doesn’t really matter if lobbying is actually not accessible to everyone as people with the right talents and expertise would pick ‘battles’ or causes that aim to improve the life of those less privileged. But to play devil’s advocate, wouldn’t this recreate a form of representation whereby these new citizen lobbyists would decide what is best for the community? And, given Alemanno’s argument about the positive effects of lobbying on wellbeing, what about the self-fulfilment needs of the less privileged? Having said that, this book remains accessible to a broad audience and is definitely an enriching read. Barbara Aubin is an LSE alumna and currently working in Public Affairs at the London School of Economics. She is also the Head of Policy at the 1989 Generation Initiative.